Take the stress out of moving day by letting Isaac’s Moving and Storage help you move. Isaac’s has been moving people and their homes and offices across the United States and around the world for over 25 years. Our wealth of experience and our dedication to providing top quality customer service for clients has made us one of the most trusted names in the moving industry. With offices in Boston, Philadelphia and Houston and partners around the world, Isaac’s Moving and Storage is your solution for a successful move at a fair price. Over 76% of our annual business is generated by people who were recommended to us by their friends who have moved with us in the past. That 76% speaks for itself and we are determined to make you our next satisfied customer. At Isaac’s we understand that moving to a new home or office can be one of the most stressful times in your life. From planning and packing your old space, to unpacking all your belongings once they’ve been moved into your new address, the entire experience can be an extremely difficult one. Let Isaac’s take the worry out your next move. At Isaac’s Moving and Storage we are determined to make your move a pleasant experience. Whether we are moving your largest piece of furniture or your smallest knick-knack; we guarantee that all of your belongings will arrive at their new home safe and sound. On top of everything else you will find the cost of moving with Isaac’s Moving and Storage surprisingly affordable. Local moves are moves within 100 miles from point to point without crossing state lines. These moves are based on the time that it takes to complete the move and the materials used. 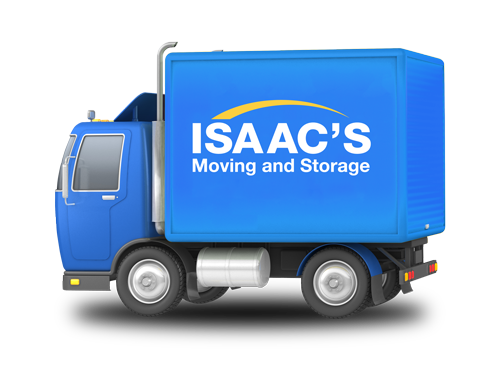 Isaac’s Moving and Storage has a fleet of trucks and a team of movers to ensure your move starts and finishes on time. In the event you need to, we have storage options to hold your house overnight or longer until the new home is ready. A longer move, over 100 miles from point to point or when crossing state lines. The delivery may be the next day or it may take several days to receive your belongings. Isaac’s will collect your belongings, pack for long distance in our own fleet, and will deliver to your new home efficiently and most importantly, in one piece! Isaac’s fleet of tractor trailers can be found at any given time around the continental United States. Relocating to another country is complex and requires a partner who understands the intricacies of trans-border moving. International land, sea or air moving involves regulations and approvals and cooperation of many private and government entities in the countries you are moving from and to. Isaac’s Moving and Storage provide origin and destination services in partnership with our FIDI-FAIM certified partners around the world. Let us plan and move your offices, warehouses, or facilities for you. Isaac’s Moving & Storage use specialized equipment and processes to help you pack and relocate to a new business location as seamlessly as possible. We will help plan a date and time that is convenient to limit disruption to business.